To better understand the role of phytohormones and antioxidative responses in plant-viroid interaction, changes in endogenous phytohormone contents and activities of key antioxidant enzymes during latent infection of Solanum laxum by potato spindle tuber viroid (PSTVd) were examined. 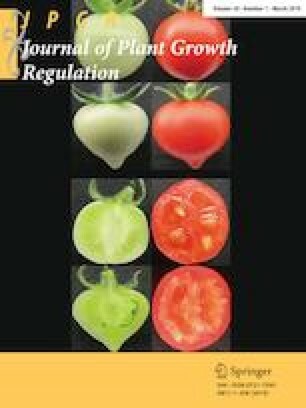 The results showed that endogenous jasmonic acid (JA) and castasterone (CS) content significantly increased, whereas abscisic acid content significantly decreased in symptomless leaves of systemically infected plants compared to that of mock-inoculated control plants. Regarding endogenous salicylic acid and indole-3-acetic acid content, there were no differences between infected and control plants. PSTVd infection also caused excessive production of hydrogen peroxide and enhanced the activity of ascorbate peroxidase (APX) and superoxide dismutase but not the activity of peroxidase and catalase (CAT). When expressed on a protein-weight base, only APX activity increased while CAT activity decreased almost by half in systemic leaves of infected plants. Furthermore, there was a fall in total glutathione content but also a rise in the content of oxidized forms of both ascorbate and glutathione, indicating that the regeneration of glutathione is insufficient. Results of this study strongly suggest the involvement of JA, CS and enzymatic and non-enzymatic antioxidants in the physiological response of S. laxum during latent infection by PSTVd. This research was funded by the Ministry of Agriculture of the Republic of Croatia (National Survey of Quarantine Organisms Program), Croatian Centre for Agriculture, Food and Rural Affairs (PhD research fellowship to JM), and by the Ministry of Education, Youth and Sports of the Czech Republic (Grant No. CR NPUI LO1204).